The key to preventing illness is to detect it early, but this knowledge is easy to neglect when we're feeling well. The problem is, many conditions don't begin to show any symptoms until they've progressed to a dangerous point. That is why it's essential to visit a health care facility at least once a year for a physical examination. During the first part of your visit we'll begin with the simplest step: we'll ask you how you've been feeling. During this time together we'll also discuss your dietary and exercise routines as well as any negative habits you may have such as smoking. 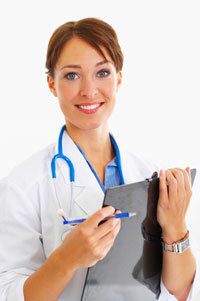 We'll also review your immunization records to ensure that you are current on all of your vaccinations. Blood pressure Test - A normal blood pressure measurement is 120 over 80. Anything at or above 140 over 90 indicates the onset of hypertension. Heart Rate Test - A healthy heart beats between 60 and 100 beats per minute. Respiration Rate - This is a measurement of how many breaths you take in a minute. A count of 16 is considered normal, but 20 times or more could be a sign of lung or heart problems. Cholesterol Test - Four measurements of the fat cells (lipids) in your blood. They are your total cholesterol, high-density lipoproteins, low-density lipoproteins, and triglycerides. Diabetes Test - A measurement of the glucose in your blood. A desirable level is below 200 milligrams per deciliter of blood. 240 milligrams or above is considered high. Heart Exam - We'll listen for any signs of an irregular heartbeat, heart murmur, or heart disease. Lung Exam - We'll listen for crackles, wheezing, or decreased breath. Head and Neck Exam - An examination of your dental health, tonsils, ears, nose, sinuses, eyes, lymph nodes, thyroid, and carotid arteries. Abdominal Exam - Performed by hand to check for any tenderness, abnormal liver size, or abdominal fluid buildup. We'll also listen to your bowel sounds. Neurological Exam - Testing the nerves, muscle strength, reflexes, balance, and mental sharpness. Colon Cancer Screening - Recommended for anyone between the ages of 50 and 75.